Focus on Faith: MAMA PEACE? 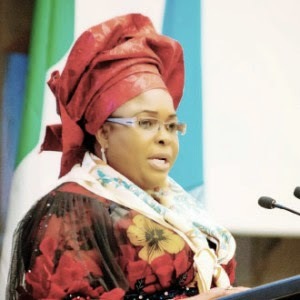 - Mrs Patience Faka Jonathan, 2nd March 2015 in Calabar. Froward potentates arrogate undeserving title to themselves; a title that is the antithesis of their true nature and disposition. Pharaoh, for example proclaimed: "I (Pharaoh) am your Lord the Highest.” (An Nazi’aat 79:24). Conscientious leaders on the other hand do not christen themselves, rather, they allow people to be their own judge and give them such appellations as are deserving of their right conduct. Islam teaches us (in Hadeeth number 4 of An Nawawi’s collection) that the signs of the Last Day will be: ‘..that you will see the barefooted, naked, destitute herdsmen competing in constructing lofty buildings…’ Of course, barefoot is another word for ‘shoeless’. So, if you see destitute people who could not afford shoes only but yesterday, and who suddenly rose to the position of owning mansions and amassing wealth, then wait for the Last Day. Whenever these ‘barefooted, naked, destitute herdsmen’ attain a piece of treasure they are not abstemious; they ‘take their comfort in this life and eat even as the cattle eat’ (Muhammad, 47:12); their gluttony is manifested by obesity, as a ‘sign of good living’, as the unthinking folk would say. Thus they lose control of both their weight, and, because they gasp for breath, the tirade of abuse that comes out of their mouths. There is an interesting hadeeth of the Prophet (PBUH) in Al Bukhaariy’s collection (Vol 2, No. 2508) where he said, “The best of you is my generation, then those who follow them, then those who follow them” ‘Imraan bn Husayn (RA) who narrated the hadeeth said, “I don’t know whether the Prophet mentioned a third generation after the two generations.” Allah’s messenger (then) said,“Verily after you will be folks who betray trust and cannot be trusted. They shall bear testimony without being asked to testify; they will promise without fulfilling their promises. Obesity will be common among them” It is amazing how aptly these words describe most of our leaders today; words that are a century and a half old! I am not a politician. My purpose in this piece is not to campaign for anybody or any political party. To me, the problem before us is beyond politics or individuals. All these evil aspersions cast against the person of Buhari are only devised as a means to the next rung of the ladder of aversion and antipathy targeted at ‘that side’ and its despised people. If a person who is seeking for your votes today, at a time when they are desperately seeking for reelection, will be bold enough to direct intemperate and vituperative language at the electorate, as we witness from Mama Peace - may Allah help that group of people after the authors of that hate speech win the election! ‘We no dey like the people from that side’ reveals a lot to us. This hate is just part of the utterance of the mouth. The hostility concealed in her heart against ‘that side’ is greater than what we hear. It is now apparent that Asari Dokubo and his ilk are actually acting a script under the aegis of Mama Peace (not that there is anything peaceful about her utterances and actions) and ‘her people’. It also underscores the reason why the campaign train of Mama Peace cannot travel to ‘that side’ for fear of running over those children that litter the streets. Or is it for fear of the stones she asked to be hurled on those who utter the word of ‘change?’. This woman is anything but peaceful or cultured. She has brought shame upon the title of ‘Dame’ which she adds to her name. Mama Peace does not go to ‘that side’ to canvass for votes; my respected ‘mother’ overseeing the women’s ministry does that on her behalf, or the hijabite spouse of the VP. The duo is doing better than Mama Peace; at least their command of the English language is better; they do not label anybody as ‘brain dead’, but treat with deference the culture and sensibilities of ‘that side’. You do not hear the childishness that characterises Mama Peace’s speeches of ‘Everybody stayed there for eight years. Now it is our turn; so, we must complete our eight years because God has ordained it.’ Or ‘I am not corrupt…. I don't touch your money. Whatever I have , I worked for it’. Prophetess Mama Peace even said recently that ‘God has told me APC will fail’; and many such nonsense with which we are inundated whenever she appears on the screen. The question here is: were the women gathered and chorusing ‘Sai Jonatan!’ because of their belief in what Mama Peace’s emissaries have conveyed to them, or were they just there for their share of the largesse? I wonder what emboldens such haughtiness in Mama Peace when she speaks during her husband’s reelection campaigns as to deride ‘that side’ she hates for bearing and littering the streets with uncountable number of children. If democracy is the game of numbers, is it not expected that politicians will exhibit a certain level of civility and respect when speaking concerning ‘that side’ in order to benefit politically from its demographic capital? Why is Mama Peace so brazenly crude and arrogantly insensitive to the feelings of ‘that side’? Praise be to Allah, who has given offspring to some people in abundance, female and/or male, and has made others barren, out of His Knowledge (Ash Shuraa 42:49-50). Those people who have no experience of bearing children of their own should rather implore their Maker to bestow offspring to them if they have not attained menopause already, instead of pontificating on what those blessed with children aught to do or not to do with Allah’s bounty! This is not to defend the way some people all over Nigeria neglect their children’s welfare; it is just that like the Yorubas say, ‘Even if the fox has more than four hundred teeth, it is not fitting for the chicken to comment on that’. Mama Peace would have done better by tendering apology to the children of ‘that side’ for the criminal negligence of allowing the kidnaped among them to rot in captivity at the hands of Boko Haram. Mama Peace should have been ashamed by the growing number of young suicide bombers from ‘that side’ who were coerced by insurgents to blow up themselves killing and maiming countless others, under the watch of her husband’s government. I wonder if the elections had been held in February as originally scheduled, and if there was no fear of card readers and angry voters who would surely boot out an inept and corrupt regime, would anyone have bothered to liberate the towns of ‘that side’ from the murderers who, until the elections were close, were merely ‘dem dem’ killing and kidnapping ‘dem dem’. One day, the ‘bloods that are sharing in Boronu will answer’ and ‘diaris God’ even on ‘that side’.